Ezemenari Obasi, director of the UH HEALTH Research Institute, conducted blood pressure screenings in May at a community health fair at Blackshear Elementary School near campus. The University’s work to improve health outcomes, particularly in marginalized communities, received a $2 million boost this spring with a grant from United Health Foundation. The partnership officially kicked off with a health fair at a city building in the Third Ward, less than two miles from campus. Egillespie Olasumba Sinayoko, a 69-year-old retiree, made the trip from Pasadena, an hour-long ride on public transportation. Using a walker, she had her blood pressure, blood glucose and body mass index checked by associates with the HEALTH Research Institute and the Texas Obesity Research Center (TORC), a multidisciplinary research group at UH. 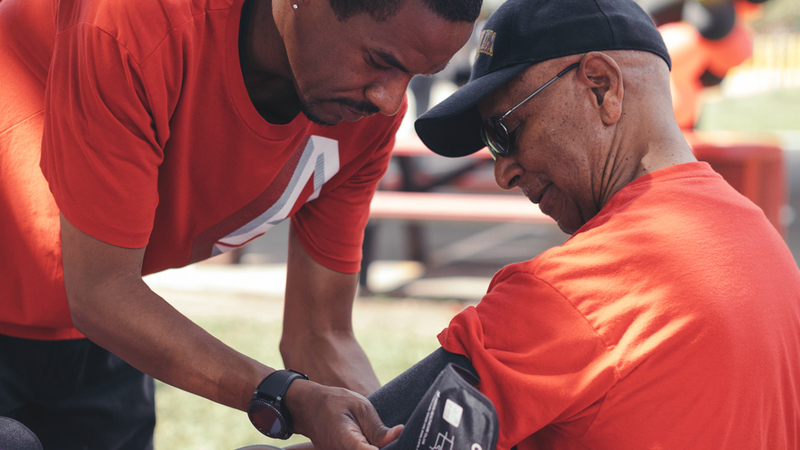 The three-year grant from United Health Foundation will fuel additional health screenings and prevention efforts in Houston’s underserved neighborhoods. Ezemenari Obasi, associate dean of research for the UH College of Education, and Dan O’Connor, chair of the UH Department of Health and Human Performance, serve as co-principal investigators. Obasi also directs the HEALTH – Helping Everyone Achieve a Lifetime of Health – Research Institute at UH, where O’Connor is a research fellow. Forming meaningful relationships and partnerships is key, Obasi said, to improving the physical and mental health of those in need. Obasi’s research focuses on eliminating disparities in health, using innovative science to better understand conditions that disproportionately affect low-income and minority populations. With a $2.5 million grant from the National Institutes of Health and the National Institute on Drug Abuse, Obasi and his team are delving into the connection between stress and drug and alcohol addictions, particularly in African Americans. The work begins in people’s homes, studying the production of cortisol – the primary stress hormone – as soon as they wake up. Later, in a 1,700-square foot lab on campus, the team evaluates their response to stressors, taking readings from electrodes strapped on their hands and chest, along with saliva samples. The idea is to look at how chronic stress – think living in poverty or continuously facing racism or discrimination – affects health and vulnerability toward substance abuse. The latest phase of the study sends participants into a simulated bar environment, neon lights and all, to assess whether alcohol eases or exacerbates their response to stress. More broadly, Obasi explains, if researchers understand the science behind addiction, they can influence ways to help. TORC Director Marc Hamilton knows people are overwhelmed with the latest health news, much of it promising a cure for obesity and other diseases linked to sedentary lifestyles. Inside his lab in Garrison Gymnasium, the search is on for solutions, combining a molecular understanding of the body with behavioral approaches to find inexpensive treatments. Community health workers recruit people who are overweight or obese, with a laundry list of related health problems; Hamilton meets with them in their homes, learning the stories behind the statistics. But his work isn’t about diabetes alone. It and other diseases – high blood pressure, cardiovascular problems, dementia and some cancers – combine to affect people in ways too complicated to be solved with one, or even a handful of medications. Physicians constrained by insurance reimbursement rates may not have time to focus on the unique interplay of multiple conditions. Meeting with people in their homes gives Hamilton insight into his subjects’ lives. Once they arrive at his lab, he can return the favor, employing high-tech equipment to show them in real time how their bodies respond to food, movement and other stimuli. Hamilton came to UH last year from the Pennington Biomedical Research Center at Louisiana State University, where he conducted seminal research linking excessive sedentary time – sitting all day at an office job, for example – with a host of unhealthy outcomes, even for people who exercise. Standing desks, Fitbits and other gadgets aren’t a public health solution, he said. TORC’s mission is to move from the micro to the macro, creating real-world therapies built upon basic science, which can be expanded to treat a wider population. Hamilton said he is confident TORC can find a way to help people live healthfully across the entire lifespan. Researchers across UH are empowering families to take charge of their health futures.